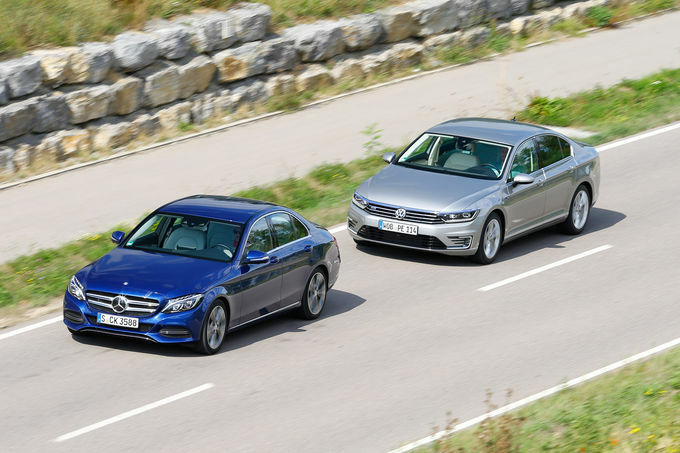 Auto Motor und Sport put face to face the new Plug-In Hybrid Mercedes C 350e with the VW Passat GTE. Mercedes C 350e is one of the ten Mercedes Plug-In Hybrid which were already launched or will be launched within 3 years. Mercedes-Benz is one of the promoters of the new Plug-In Hybird technology. Daimler think that the new technology will be able to help Mercedes-Benz to fulfill the CO2 emission limits imposed by EU for 2020. On the other hand, the models with the new Plug-In Hybrid technology are in no danger to be banned in big cities around the world because of emissions. Theoretically, VW Passat GTE and Mercedes C 350e can be driven pure electrically for 50, respectively 31 km. But the official fuel consumption is only a dream. 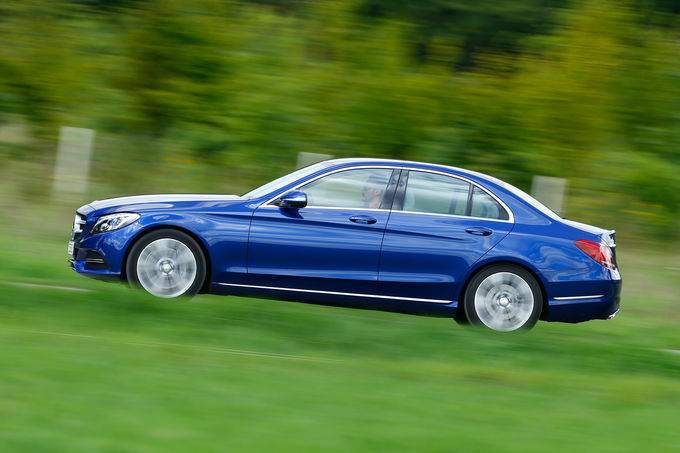 Mercedes announce 2.1 l/100 km for C 350e while VW declare 1.6 l/100 km for the Passat GTE. Mercedes C 350e combine a 2.0 liter 211 HP turbo engine with 82 HP electric engine and delivers a total of 279 HP and 600 Nm. At Passat GTE, 1.4 liter turbo with 156 HP works together with a 116 HP electric engine for a total of 218 HP and 400 Nm. Both cars have a similar drive structure. The electric engine is placed between the thermic engine and the gearbox and the Li-Ion battery is positioned above the rear axle and affect around 30% of the boot space. The battery can be charged at a wallbox or at 220V network. The 9.9 kWh battery in Passat needs between 2h 30 minutes and 4 h 15 minutes to be charged while the smaller 6.4 kWh in C 350e needs between 2 and 3 hours to be charged. Both cars rely on Navigation data to optimize the drive. If a programmed route will end in the city, the computer retains enough battery reserves to run on electric power as much is possible in the city. There are also modes in which the driver can choose to run only with electric power, to recharge the battery or to preserve the battery energy. Like the S 500e, Mercedes has an intelligent recuperation system which works in conjunction with Collision Warning and Emergency Braking system. If the car in front brake, Mercedes uses the recuperation with maximum efficiency. If the car in front goes with constant speed, C 350e decouple the engine and the car goes in Sailing mode also with maximum efficiency. Both cars are not cheap. Mercedes C 350e costs 6,000 euro more than the C 250 while the Passat GTE is with 9,500 euro more expensive than the 1.4 TSI DSG. Auto motor und sport tested the fuel consumption and the electric range. Mercedes promise 31 km eletric range but in the real world the maximum was 23 km. According to auto motor und sport fuel test route, C 350e needs 3.6 l/100 km and 10.6 kWh for every 100 km, which correspond to a 144 g/km CO2 emission, This value is far above the 112 g/km CO2 obtained by Passat GTE (1.4 l/100 km and 14.2 kwh for every 100 km). On the other hand 112 g/km CO2 correspond to a fuel consumption of 4.3 l/100 km for a diesel engine, which is an impressive result. Passat GTE has also a greater electric range with 47 km, very close to the 50 km official electric range. 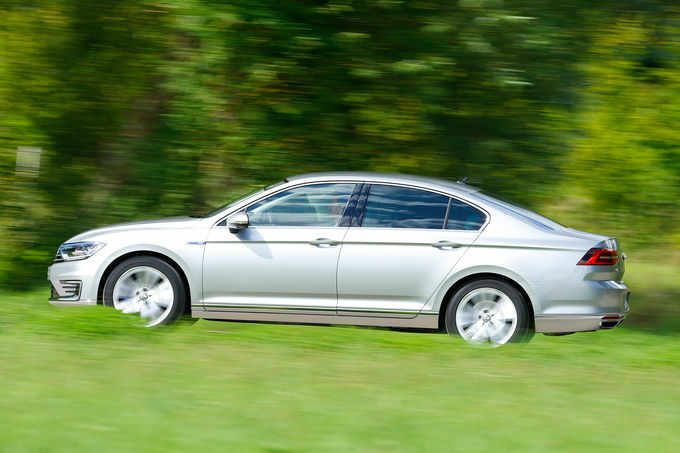 We can explain the longer electric range of Passat because of its bigger battery. 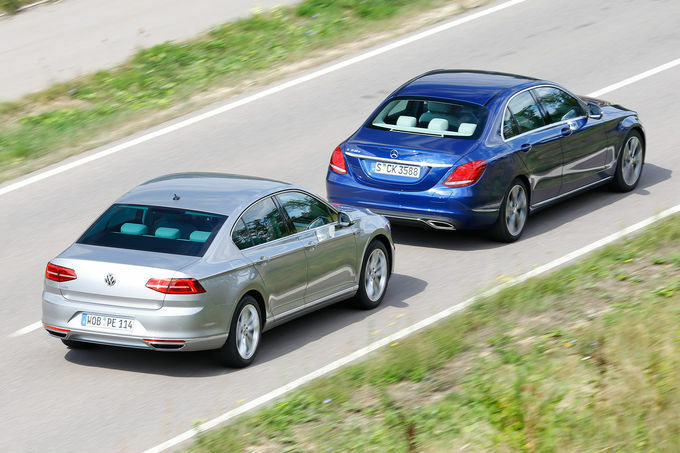 Passat has also a more performant electric engine while Mercedes has a stronger petrol engine. In this way there is an explanation also for lower fule consumption in Passat. With the empty battery and without electric engine, Passat GTE needs 5.2 l/100km for every 100 km, while Mercedes C 350e uses 6.2 l/100 km but is more temperamental. With the Airmatic suspension standard in the C 350e, Mercedes offers a better comfort and a more homogeneous behaviour despite the fact that Passat GTE test car has the optional adaptive suspension. The 125 kg battery in Passat affect the handling and the steering is not so precise and direct lile in other VW models. Who understand german language can read the full test in auto-motor-und-sport website.